The 7-bone roast is one of the most classic chuck roasts from the golden age of beef. We call it the golden age because it hearkens back to a time when Americans ate a lot of beef and had plenty of time to serve cuts of meat that might require three hours of braising time for their everyday dinners. The 7-bone roast is basically a slab of beef produced by making thick vertical cuts straight through a whole square-cut beef chuck, which comes from the shoulder section of the steer. And it doesn't have seven bones in it. It's called a 7-bone roast because the cross-section of the shoulder blade bone looks like a numeral 7. To produce a 7-bone roast, the butcher basically runs a beef chuck through a band saw. Starting at the rib end, you would get a couple of 2-inch roasts called first cut chuck roasts or blade roasts. And then the next three slabs would be considered 7-bone roasts. This is because the medial ridge of the shoulder blade bone, the cross-section of which forms the numeral 7, only begins to protrude a few inches up the shoulder blade. Of course, how many shoulder roasts you might get from a single beef chuck depends on the size of the chuck primal and how to thick you cut them. But there are at least five or six. Note that roasts cut from the bottom of the chuck are called arm roasts because they feature a cross-section of the humerus or arm bone. 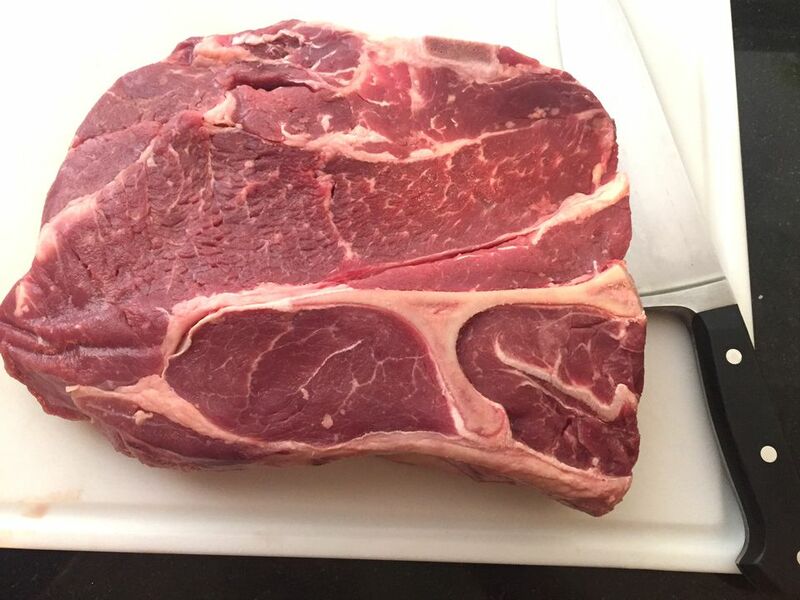 A typical beef chuck will yield about three arm roasts, in addition to the 5 to 6 shoulder roasts. The 7-bone roast will usually include the infraspinatus (top blade), supraspinatus (chuck tender), serratus ventralis (chuck flap), triceps brachii (shoulder center) and subscapularis (blade flap) muscles. A 7-bone might also include parts of the rhomboidius (hump meat), splenius (Sierra steak), complexus, spinalis dorsi, longissimus (ribeye), teres major and/or teres minor, again depending on how it's trimmed and whether that particular roast came towards the rib end or closer to the neck. Most of these muscles are fairly tough, but a few of them are actually pretty tender, and increasingly butchers are pulling them out to make steaks and roasts like the flat iron steak or chuck-eye steak, which are more profitable than a 7-bone roast. You can read more about the different steaks and roasts that come from the chuck primal cut. In addition to the shoulder blade bone, a 7-bone roast might also have a cross-section of the thoracic vertebrae (i.e. the backbone). To me, bone-in roasts are always preferable, whether you're braising or roasting because the bone adds amazing flavor and moisture. And like beef chuck generally, the 7-bone also has a lot of connective tissue (i.e. gristle) in it that would be tough to chew if you roasted it. But the long, slow application of moist heat basically melts away those chewy bits and enriches the braising liquid, which can then be used to make a fantastic sauce. Another thing with the 7-bone roast is that it's really big. Imagine a roughly triangular slab of meat whose three sides measure 10 x 12 x 15 inches. In other words, it's a lot of meat, and the whole thing might not fit in your Dutch oven. For that reason, a butcher might cut the roast in half, right through the medial ridge, to produce two roasts. In the photo above you can see a 7-bone roast that's been trimmed to fit in a 5-quart baking dish, which is 15 inches long by 10 inches wide. And actually, that's not a bad way to cook it, since a 7-bone roast needs long, slow, moist heat cooking (i.e. braising). The only thing you won't be able to do in the glass baking dish is brown the outside of the meat, which in addition to color, adds a lot of flavor and texture. However, if you truly don't have a piece of stovetop cookware that's big enough to accommodate a whole 7-bone roast, you can always brown it under the broiler (both sides) and then transfer it to your baking dish, along with some liquid like beef stock, for slow braising in the oven.